Adventuring, travelling, exploring, each activity is fun in its own way. However, what’s the point of an experience if you can’t revisit it whenever you want? Some spaces are too tricky for you to free up your hands to take a photo, or you need your full concentration instead of focusing on creating video footage. That’s where the action camera comes in, and it is a brilliant solution to any situation where pulling your phone out is just not feasible. There is nothing vain about capturing every moment of your experience, and we understand the importance of cherishing memories. Finding the perfect action camera on a budget is not necessarily the easiest task, but it will be worth it for the results – and the ability to snap a few shots without using your phone. In order to help you find the best budget action camera (under £100), we have put this guide together, compiling all of the relevant action camera (under £100) reviews in one place, so you can find the best one for your next journey. Action cameras can be pretty expensive, and that can make finding one on a budget a little trickier than it should be – especially since you want one that is good quality. This model from AKASO could be just what you needed, so take some time to read the reviews below and see what you think. 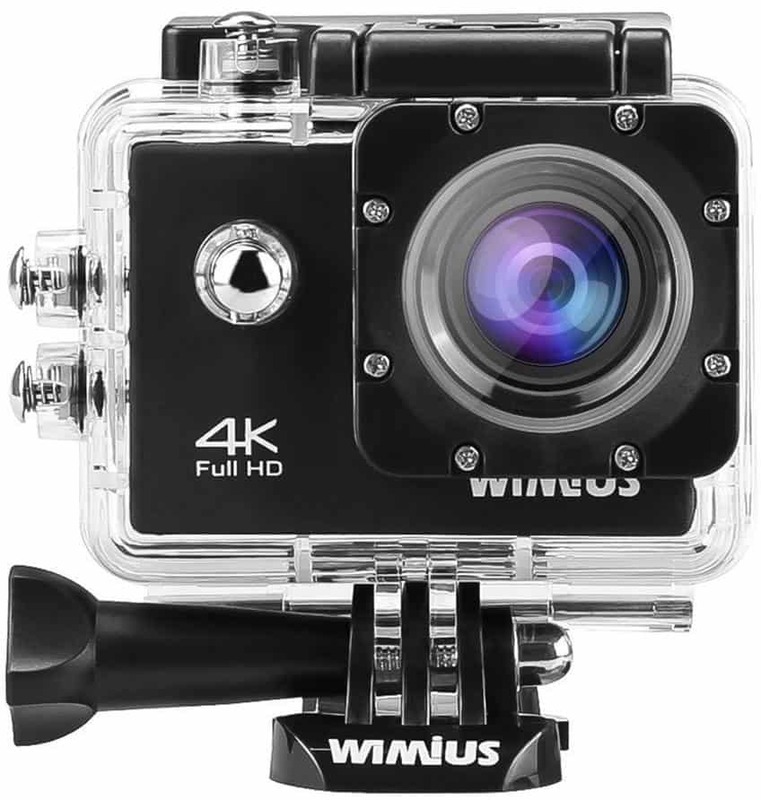 This action camera is able to record and play footage in 4k Ultra HD, so you can relive your memories as though you were there all over again. It has four times the resolution of a traditional HD camera, so the photographs you take will be stunningly clear and truly capture the adventures you have been on. Plus, it has a really long battery life so that it can stay around and ready for your big days out. It has Wi-Fi built into it so that you can connect your phone or tablet up for remote control whenever you want. Plus, it allows you to edit and share your clips and photos at will so that your friends and family can join in with your travels. There is even a wrist strap included that acts as a remote control. Additionally, if diving is your thing, the waterproof case can go up to 100ft under. The instructions are not always the easiest to follow, especially for the mounts. 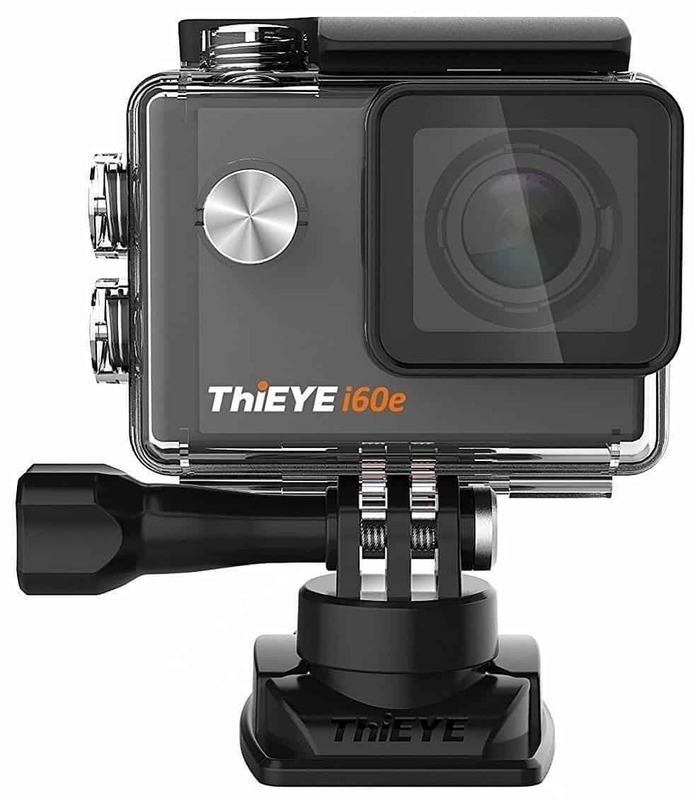 This great little action camera comes at a brilliant and affordable price, which is great for those who want something entry level and good quality. While the instructions are not always the easiest to follow, once you have it all set up you will find that it was well worth the time you spent fiddling. With 4K video and amazing resolution for the photographs, it’s the perfect way to capture the important moments. Just remember to buy the right micro SD card to use the HD settings. This action camera comes from a good brand, and is sure to be a reliable piece of kit once you get it started. If you want something that comes with a budget price tag and will still be able to keep up with your adventures, then you might want to take a moment to look at this model. This nifty little action camera comes at a great and portable size. It is able to film and capture photographs in HD, so that you can keep your most cherished memories close to you. The 170-degree wide angle also ensures that you are able to snap everything in one picture – you won’t miss a thing. Additionally, the battery life is fantastic, and it comes with two so that you never run out. It is waterproof up to 60m, making it perfect for a professional underwater shoot, as well as those who dive avidly. It even has Wi-Fi built into it so that you can connect up to your mobile device, allowing you to share your images and videos with loved ones and social media. It also allows you to control the camera remotely, so you never have to miss a film or photo op again. The sound quality is ok, but not as good as other budget action camera models. This action camera is incredibly affordable, and will likely slot into most budgets quite comfortably. It is perfect for a range of activities, and even comes with mounts so that you can attach it to yourself or the inside of your car. While the sound quality is not as good as other models, it still does the job, and it is not horrific to listen to. Overall, it is great value for money and certainly worth investing in if you are searching for a cheap camera. 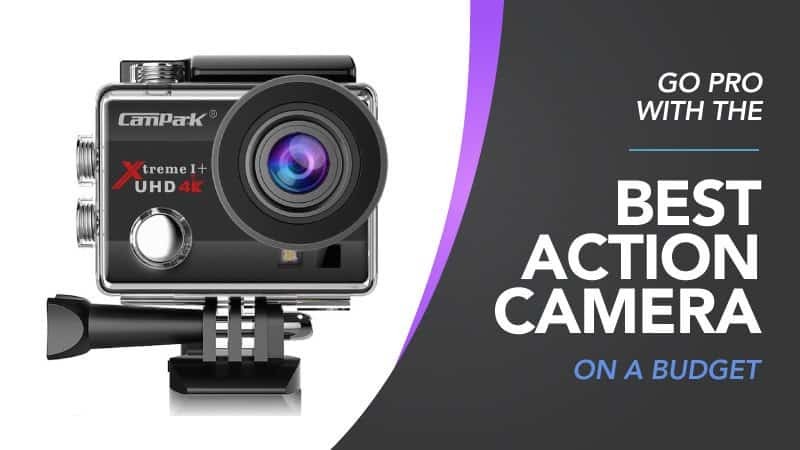 Another great budget actions cam, this one could be one of the most reasonably priced models that we have on offer here. With everything you need (and more) in one neat little package, this is an action camera that you simply must check out. Read the reviews and see if this is the one for you. This excellent little camera is able to film in 4K HD and can also take photographs in high-resolution, allowing you to experience your trips and favourite moments as though you were there all over again. The recording is incredibly smooth, and you can also alter the resolution to meet your current needs. It can support a 64GB memory card, and the battery life will keep you going all day long. It is waterproof, which makes it perfect for outdoor adventures, and has Wi-Fi built into it so that you can connect to your smart device and post images and videos to social media, sharing them with your loved ones. The LCD screen gives you an excellent viewing experience, and the wide-angle lens creates immersive photos and films. Plus, it’s really sturdy and robust. The instructions are a little vague, and it can only be mounted if it is in the waterproof case. 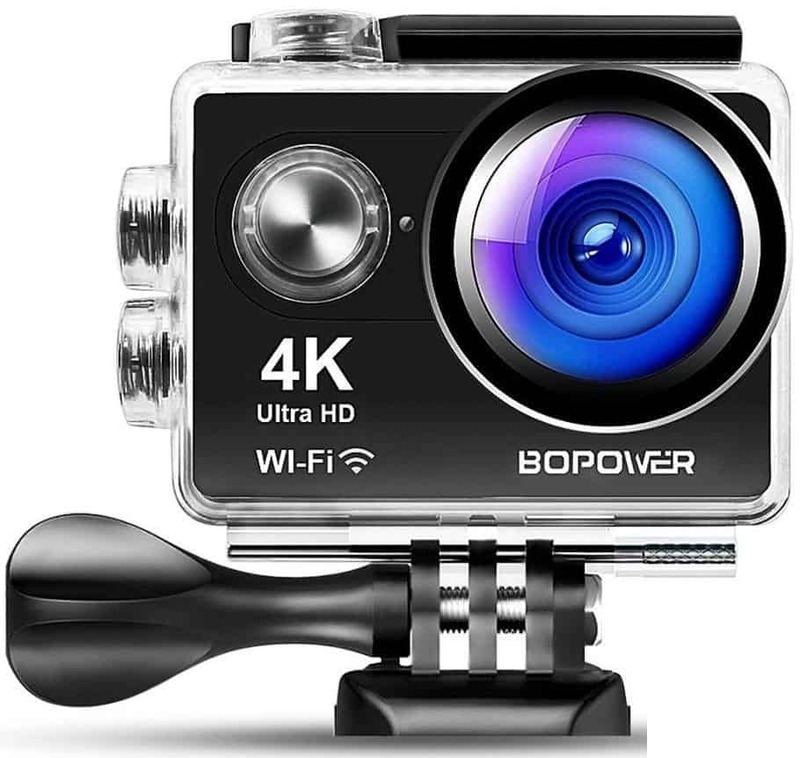 This little action camera is great value for money, and comes at a budget price that you are sure to love. While the instructions aren’t the best, it shouldn't take too long to work them out and get started, leaving you free to get on with your adventures. It has a load of great additional features that will make things easier and more exciting, as well as 4K filming for a truly memorable experience. A great model for everyone, available at a good price. 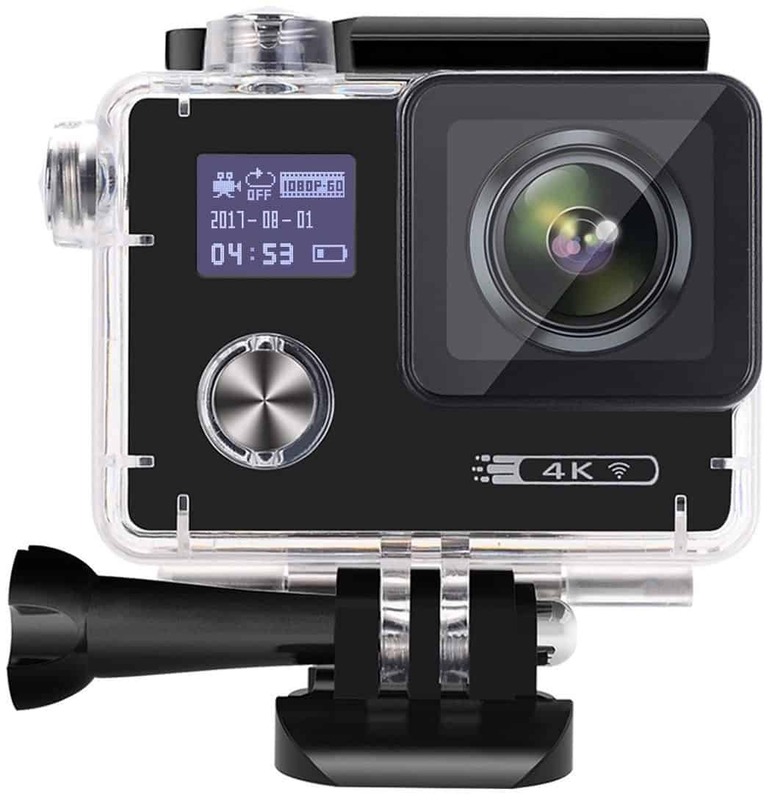 This sleek action camera comes with a dual screen and is able to support real 4k HD images and video, so you can relive your best moments as though you were there all over again. The lens is a 170-degree wide angle so that you can capture everything, and it is anti-shake for still and crystal-clear footage. It has a long battery life that will keep going through even your longest adventures, and can connect to your phone via Wi-Fi so that you can control the camera remotely. Waterproof and with an amazing list of additional features, you’ll be amazed by what it can do for the price. This 4k HD action camera is ready for action and will serve you well no matter what you’re doing. From hiking to skiing, it has you covered, and you can record all of your best moments to watch over and over again. It can be connected to your phone using Wi-Fi so that you can control the camera remotely, and you can even use your mobile device to edit the videos. It has a waterproof case to keep it safe if you decide to go diving, and can withstand depths of up to 30m (nearly 100ft). Rechargeable and with a great battery life, it’s not just the price that will leave you impressed. Hopefully, this guide has helped you to find the best budget action camera (under £100), and that the action camera (under £100) reviews have given further aid, allowing you to discover the best one for your next trip or adventure. With so many to choose from, we are sure that you will find the perfect action camera to record all of your best moments. 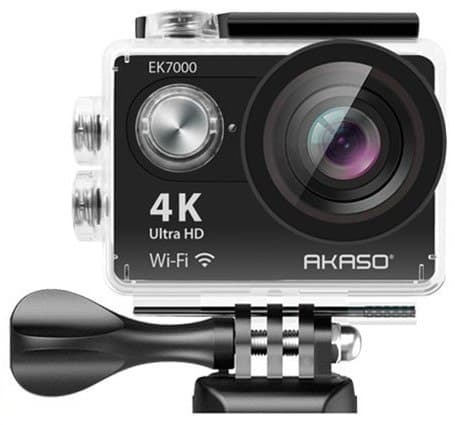 After all, we have gathered a brilliant selection of action cameras from a number of great brands that are sure to leave you feeling impressed. Each of them is excellent quality and sure to please you, so we hope that you will give at least one model a chance. Plus, they come at a great range of prices to suit just about any budget, and most have an incredible tech range. It’s the perfect bunch. What did you think of our action camera guide? Are there any that you would have liked to see or recommended? We love hearing from you, so make sure to leave us a message in the comments below.